This excellent under sink cabinet fits around most sink standard pedestals to make the most of your space. 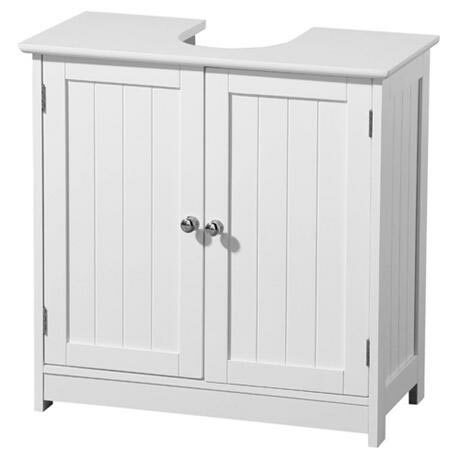 Made from MDF with a painted white wood finish, the neutral colour will fit in with any bathroom decor. Q. I have just bought the medium Burilngton basin from you, will this fi around it. Yes the White Wood Under Sink Cabinet will fit the dimensions of the Medium Burlington Basin and Pedestal. Thanks. Q. Is the internal shelf adjustable? Hi, no the shelf inside this cabinet is not adjustable. There are pre drilled holes to show where to fix the shelf in place. I hope this helps! Q. Can the unit be painted? Hi Anita, yes this under sink cabinet can be painted, however, please note that if painted then the guarantee will be void. Thank you! Q. Can it be painted? Hi Anite, this under sink cabinet can be painted, however, please note that once it has been then the guarantee will be void. Thank you for your question! The White Wood Under Sink Cabinet has a smooth matt finish. Thanks. The White Under Sink Cabinet comes with one inner shelf. Hope this helps! Q. How wide is the main unit, not including the countertop (which looks wider)? Q. Could a counter top basin be mounted on this cabinet? Does it include a shelf? Hi. No we don't recommend this for a counter top basin as it is made to fit under the basin, so I wouldn't have said it was tall enough. Yes it does include a shelf. Hope this helps! I bought this item and built it today. It is poorly made with cheap parts and feels flimsy. It is too low for most sinks so sits with a large gap between the basin and the unit - with looks stupid. I cannot believe I paid £60 for this item - I would pay £20 maximum. I purchased this item as I didn't want a bathroom cabinet on the wall an I have a small bathroom. The item arrived the day after I ordered it. I did have a slight issue with one of the wooden panels having some damage on it but this was rectified quickly and replaced. It is easy enough to construct but the instructions are not the best if you need them (very small writing which may cause a problem for some) but once I put this item together and placed it under the sink it looks really effective and there is plenty of space in the cabinet. Overall I would recommend this product to anyone. I was really happy when i recieved my new cabinet, I am surprised at the quality as the price is so reasonable. Looks brilliant in my new en-suite and have already made a new order with Victorian plumbing. Fab Service! Good quality, and easy to assemble.